KATHMANDU, Oct 09: Nepal Airlines Corporation (NAC), the national flag carrier of the Himalayan country, conducted its first passenger flight with Chinese made Y-12e planes to Tenzing Hillary Airport at Lukla, a gateway to Mount Qomolangma in eastern region on Saturday, a senior official of the NAC said. 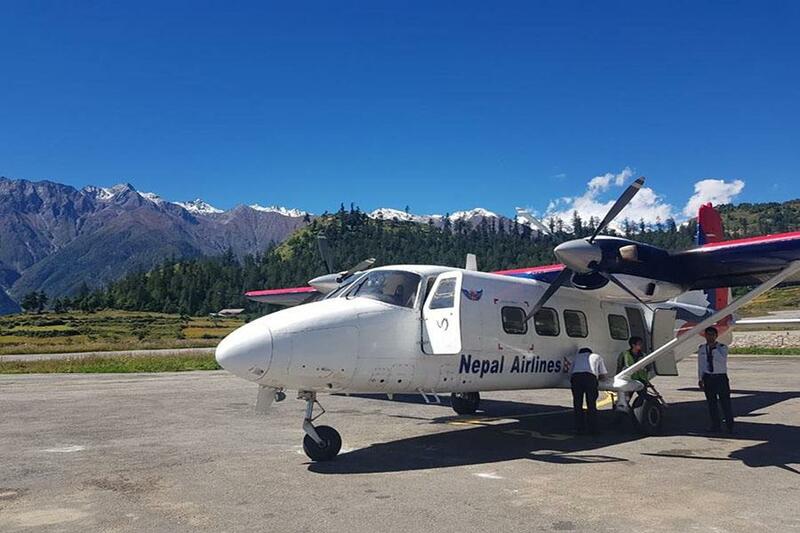 After conducting test flights to different remote airports including in Lukla last week, the 17-seater Chinese-made planes were used to fly to Tenzing Hillary Airport which is located at an elevation of 2,800 meters in eastern Solukhumbu district. Although the NAC has four Y-12e planes in its domestic fleet after it first received one in July 2014, the national flag carrier had not conducted flights to remote mountainous areas, citing some technical issues as well as pilot shortage. The NAC now plans to fly them in several remote mountainous airports including at Lukla and Jomsom in remote Mustang in western Nepal, and Jumla, Dolpa, Simikot and Talcha airports in the country's remote Karnali region in the mid-Western part of the country on a regular basis. "The flight to Lukla is the first step towards conducting the flights to the country's remote regions with Chinese made planes," Ashok Sigdel, spokesperson at the NAC told Xinhua on Saturday. "We conducted one regular flight and one chartered flight with Y-12e planes." It is also the first time that the NAC conducted scheduled flight to Lukla with any plane after the gap of two years. By resuming flights to a tourism destination like Lukla, the NAC also aims to benefit from an increased inflow of tourists during the current tourist season. "There will potentially be four flights with Chinese planes," said Sigdel, who is also acting deputy director at the NAC. Before flying them to the remote areas, the NAC had taken the approval of the aviation regulator, Civil Aviation Authority of Nepal. The NAC's move to fly the planes in the remote areas is expected to ease many Nepalis who travel to remote areas from Kathmandu to celebrate Dashain, the biggest festival of Hindus in Nepal when Nepalis around the world gather at home to celebrate the festival which begins in Mid-October. The NAC, which was facing the shortage of pilots to fly the Y-12e, is now in a better position with availability of four captains and seven co-pilots, according to NAC. "The number of pilot is still inadequate and we will increase their number gradually," said Sigdel. Besides four Y-12e planes, the NAC has other two MA60 planes manufactured in China. Currently, the NAC has nine planes in its domestic fleet and six of them are Chinese made. There are other three Twin-Otter planes with the NAC.